Warm wishes to all my cherished video programmers on a cold winter day! It’s Andy Gesner and the staff from HIP Video Promo, coming at ya with another terrific new clip from an under-the-radar favorite. Most bands – even bold, independent, experimental ones – start out great, and then slowly misplace the elements that make them distinctive. Not so for of Montreal. Kevin Barnes’s indiepop project keeps right on climbing, adding new techniques, refining its approach, and releasing recordings of great integrity and individuality. Each of Montreal album seems to trump its predecessor: The Sunlandic Twins, their ’05 release, featured a seamless integration of Elephant 6-style homemade pop and the electronic elements that Barnes first introduced on ‘04’s Satanic Panic In The Attic. Sunlandic Twins was perhaps the most danceable indiepop album we’ve ever heard – full of funky bass-lines and guitar-and-synth grooves. Barnes called it “21st century ADD electro-cinematic avant disco”; we think of it as magnificent state-of-the-art experimental dance-pop. Since the release of The Sunlandic Twins, Barnes has been busy: he’s toured non-stop, and put out another one of his between-album teaser EPs (he seems to draw from a bottomless well of catchy melodies). Now comes Hissing Fauna, Are You The Destroyer?, which sounds to our ears like the best of Montreal album yet. It’s every bit as danceable and mysterious as The Sunlandic Twins was – the electronic beats, elastic basslines, and intoxicating synth textures have returned. But while Barnes recorded almost everything on Sunlandic himself, this time, he’s working with friends and family. Long-time band members B.P. Helium and James Huggins appear on record, as do Barnes’s wife and daughter. Barnes’s fascination with Scandinavia, hinted at onSunlandic and Satanic Panic, is also much more evident here – half of the album was recorded in Norway, and many of the lyrics (and song titles) evoke Northern Europe. And for the first time, Barnes gets personal: the stories here feel autobiographical and maybe even a bit confessional. He’s as playful as ever, though, and in songs such as “Heimdalsgate Like A Promethean Curse”, he flashes his ability to twist 60s pop like a balloon-sculptor. The Sunlandic Twins topped many critics’ “Best Of” lists for 2005, and undoubtedly raised of Montreal’s profile. 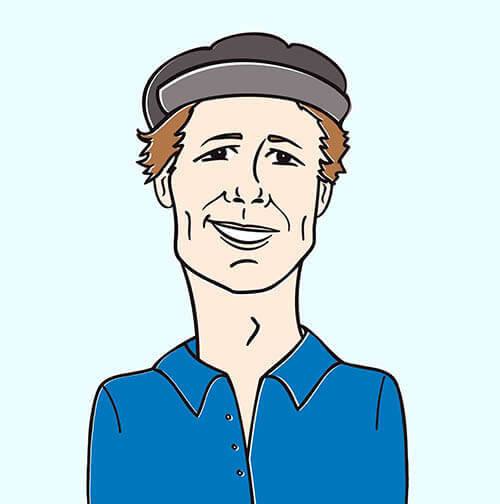 The band has always been championed by pop obsessors; but recently hipsters, webloggers, and even casual mainstream listeners have become familiar with Barnes’s melodic gifts. 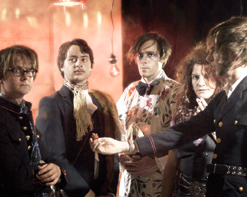 Expectations have been raised for the next of Montreal tour – Barnes promises something theatrical and visually intriguing. The clip for “Heimdalsgate Like A Promethean Curse” might just be an indication of the stage show they’re brewing up. It’s set on the stage of a small theatre, where Barnes, dressed in sparkle makeup and outrageous costume, is the star of a low budget production. A cardboard comet streaks across the stage; patrons sit at café tables; an archer in the gallery shoots an arrow at the main character (Barnes catches it, and keeps right on singing). The audience consists of appreciative hipsters, and at least one ghost. But it’s not all whimsy. Some of the images are truly striking: four black-stockinged figures dancing behind blank masks, men dressed in suits of lightbulbs, and four critics gather around Barnes and move robotically as they take notes on his appearance. In short, the “Heimdalsgate” clip balances its humor with strangeness, fascination, and fright: just as Kevin Barnes and of Montreal have been doing for more than a decade. After the incredible amount of success and fun we had with the previous of Montreal videos “Requiem For O.M.M. 2” and “Wraith Pinned to the Mist and Other Games”, it is our greatest pleasure to once again be working with Matt Lunsford, Seth Hubbard, and everyone at Polyvinyl Records to bring you the first must-see video of 2007. of Montreal will be playing in a town near you soon, so don’t hesitate to be in touch to set up video interviews with enigmatic Kevin Barnes and co. We also have copies of Hissing Fauna, Are You The Destroyer? available for all of your on-air giveaway needs. If you need more info, call Andy Gesner at 732-613-1779 or e-mail us at info@HIPVideoPromo.com . You can also visit www.PolyvinylRecords.com,www.ofMontreal.net, to find out more about of Montreal.